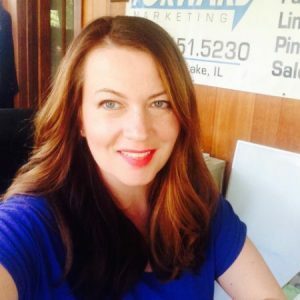 Vanessa Baker is the owner of Fast Forward Marketing in Crystal Lake, IL. We are a friendly and focused local resource for digital marketing and advertising. On a typical day, you will find us speaking with small businesses about how to drive sales using digital marketing including: * Search Engine Optimization Best Practices * Social Media * Online Video * Online Display Ad Management including Behavioral Targeting * Website Development and Maintenance * Email Marketing * Blogging * Press Releases * Reputation Management * Search Engine Marketing (Google Adwords) Winner of Shaw Media “Best Under 40”, received Crystal Lake Chamber of Commerce “Presidential Award of Excellence” and New Business of the Year award from the Algonquin/Lake in the Hills Chamber of Commerce. For us- it is all about relationships. There is something so special about walking into a local business, and being greeted with a warm handshake or hug from a client. It feels good to know that you are helping someone in a real and concrete way with their small business. We have been very lucky recently to develop strategic partnerships with other strategic marketing consulting firms and technology firms. We have to keep track of 24 different clients’s campaigns, which can get overwhelming! Love Evernote to capture ideas, meeting notes, business cards- it is easy to find again when we need to work on a project. Also, we are in the process of becoming certified in Google Analytics, as it is the cornerstone to any campaign. My small business clients depend on a local healthy economy. My plans to help us have a local health economy include helping my small businesses sell more products and services while saving money on marketing, and volunteering at local community events and with my local Chamber of Commerce to increase the quality of life for our community. If you are a business owner looking for a local trusted resource to help you with digital marketing in the McHenry County in IL, check out Fast Forward Marketing! We also publish a local political conversation site at MchenryCountyVoter.com.